Most of us have no need for Panasonic's Toughbook-30: Its specs are unremarkable and the 13.3-inch laptop weighs over 8 pounds. But then, our mortal laptops could never survive the ridiculous, almost cartoony beating Forbes gave it. 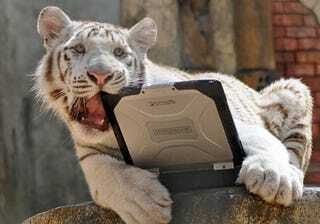 Forbes's intrepid testers used the Toughbook to crush soda cans, used the screen as a dartboard, ran over it with a Volkswagen, gave it to a tiger as a chew toy, had an elephant stomp on it multiple times, and then the to top it all off, shot it with a .22 pistol. And the damage? The only things that managed to do any lasting damage were the elephant and the gun; the elephant put two cracks in the case (purely cosmetic, however), and the gun did actually pierce the screen. But! The damn thing was still usable even after being shot! It never once ceased to boot and Forbes claims they were able to log into Windows even with a hole in the screen.